dressed up like a lady: Adventurous. This outfit makes me want to play the tenacious female co-star in a 1980's adventure movie. Activities often include trying to break up a bar-fight between what turn out to be mercenaries, demonstrating curiously extensive knowledge of a coveted historical artifact, and taking over the controls to make an emergency landing in a bi-plane. 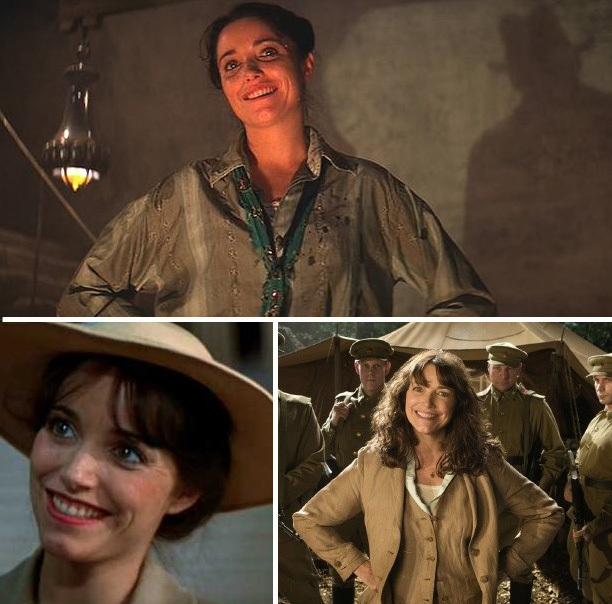 Clearly, the most beloved and awesome figure in this category has got to be Marion Ravenwood, played by Karen Allen in Raiders of the Lost Ark -- she's the scrappy, whip smart chick that the whole archetype is based on. But for me, style wise, it's hard to beat Nazi villainess Dr. Elsa Schneider, played by Alison Doody, in Indiana Jones and the Last Crusade. That evil 1940's bombshell look is so dang sharp. I love your blog! you always look so stunning! I think you nailed the "gal adventuress" look... how I do love those two Indiana Jones girls' style! Love the outfit! You definitely captured the "explorer" vibe. Elsa's fashion sense was top notch, from exploring Venetian catacombs to reaching for priceless artifacts above a precipice. If only she hadn't worn those slippery leather gloves on her hands, she might've had enough time to reach the grail... I never understood why she insisted on wearing them inside the temple.